Designed by Christian Gobrecht. Variety 2. 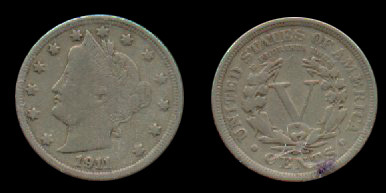 Seated Liberty Half Dimes were minted from 1837 - 1873. Variety 2. Designed by Charles Barber. Cents was added to the bottom of the reverse to discourage people from gold plating the coin to pass it off as a five dollar piece. James Fraser designed this coin. His model for the bison was "black Diamond" of the New York Zoological Gardens. 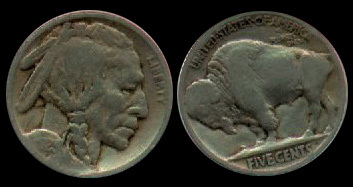 Minted between 1913 - 1938.